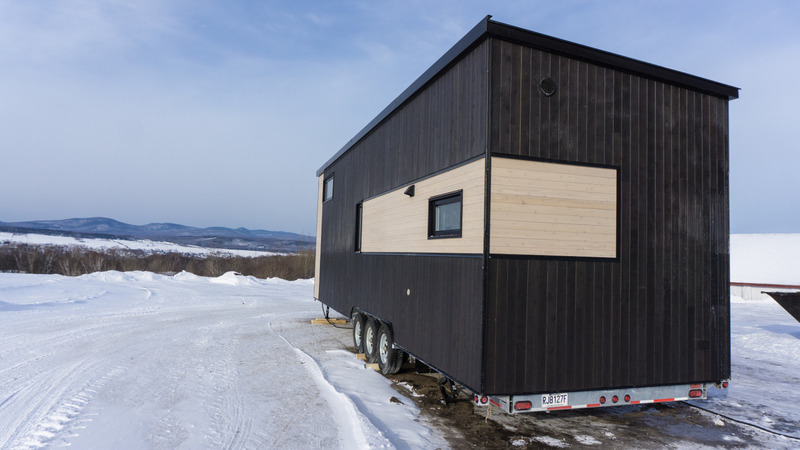 Due to limited space, designing a tiny home can be a very complicated task, but when designing a structure that can withstand extremely frigid temperatures, its a different beast entirely. Just ask Canadian tiny home builders, Minimaliste Houses, who specialize in creating durable tiny homes built to withstand Canadian winters. 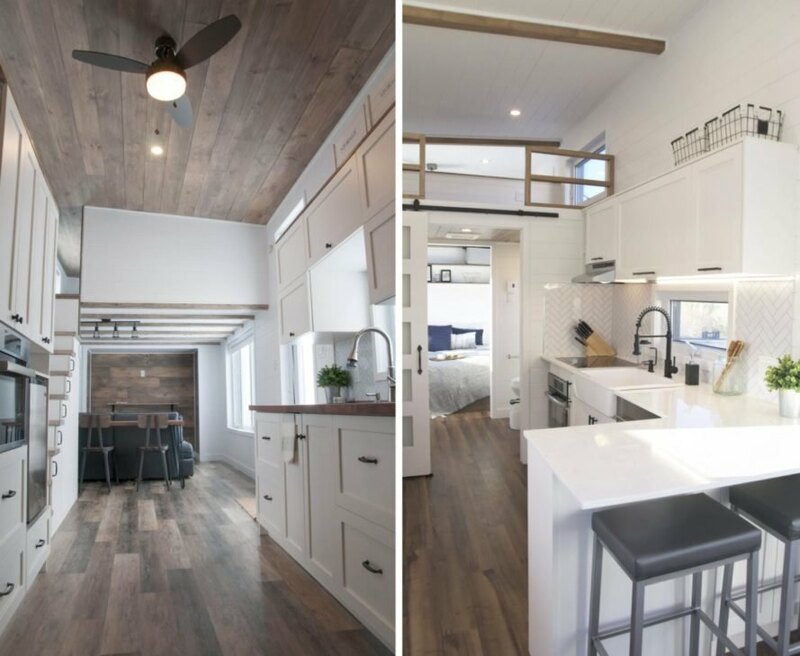 The designers have just unveiled the gorgeous Ébène Tiny Home, which was designed to be energy-efficient thanks to tight thermal insulation and a hydronic heating floor system. 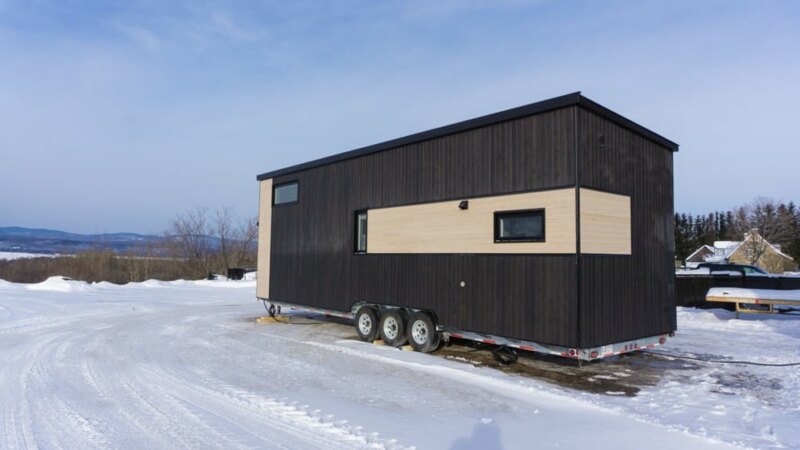 The exterior of the tiny home on wheels, which is 34 feet long, is clad in a sleek black cedar, with a contrasting natural wood color. As part of their 4 seasons Tiny Home collection, the Ébène tiny home boasts several passive features such as its strategic window placement. Most of the home’s windows are installed on the southern side, with only three small windows on the northern side. 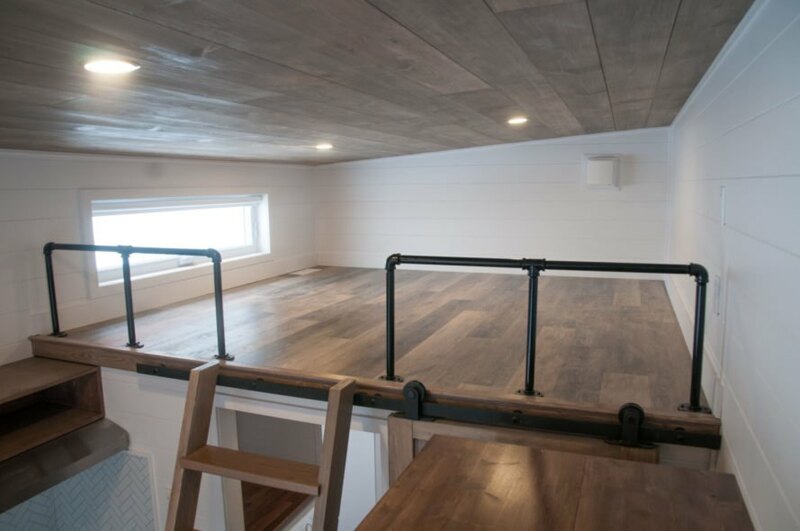 The home was also installed with a hydronic heating floor system to keep the interior space warm and cozy during the most frigid months of the year. 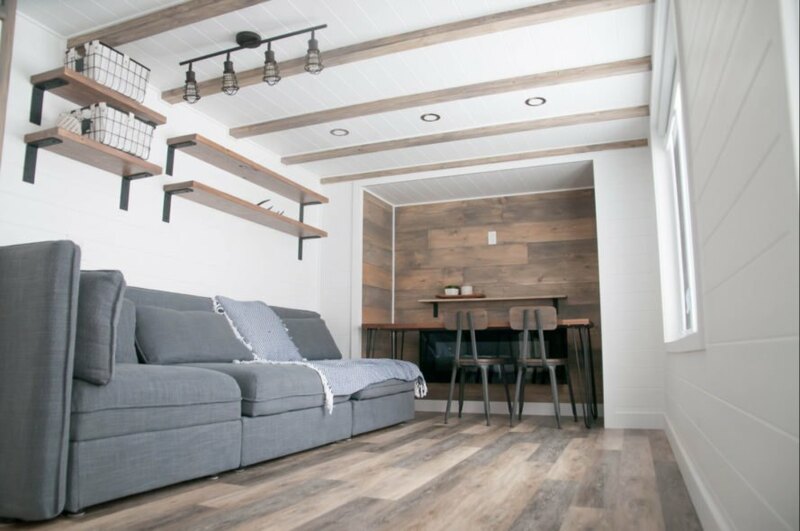 Working with the clients, a young couple from Ontario, the designers wanted to create a soothing, but functional living area for the 475 square feet home. All white walls are sandwiched in between wooden flooring and a high ceiling which feature cross beams, giving the home a modern cabin feel. For the furnishings, the interior design went with simple, but functional furnishings. Large windows, equipped with solar blinds for privacy when needed, bring in lots of natural light during the day, making the living space bright and airy. 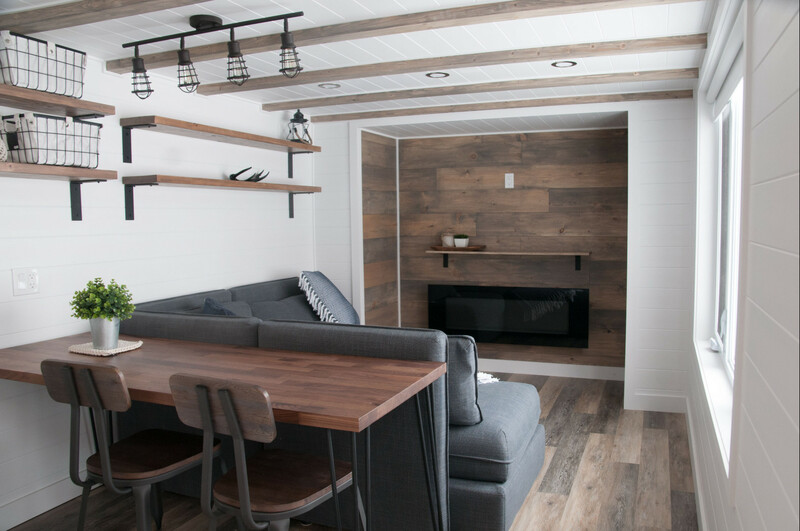 A compact, but cozy sofa sits adjacent to a wooden accent wall that juts out just a bit from the structure’s end. 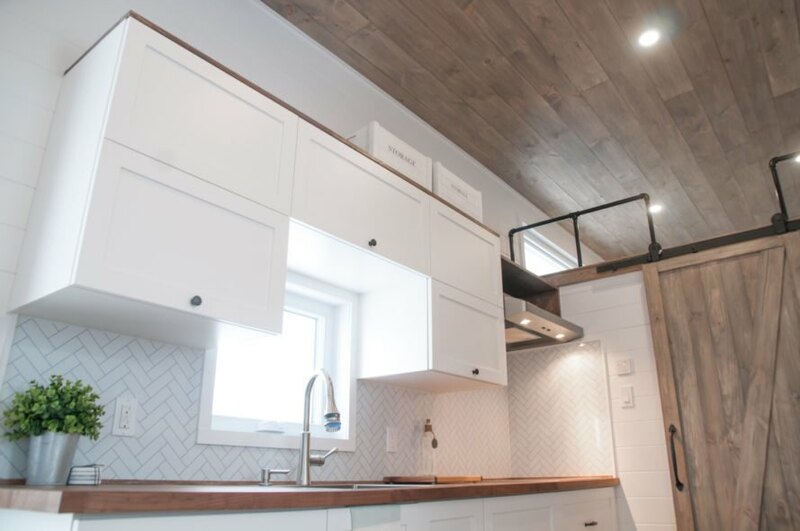 This space was outfitted with a high top counter, perfect for dining or working. On the other side of the living room, a modern kitchen is surprisingly spacious, with custom cabinetry. 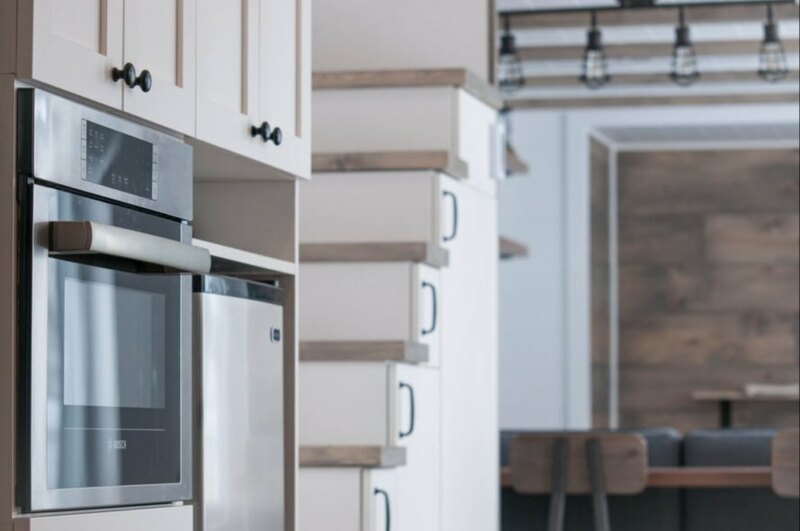 Plenty of storage and working space make it a dream come true for any home chef. 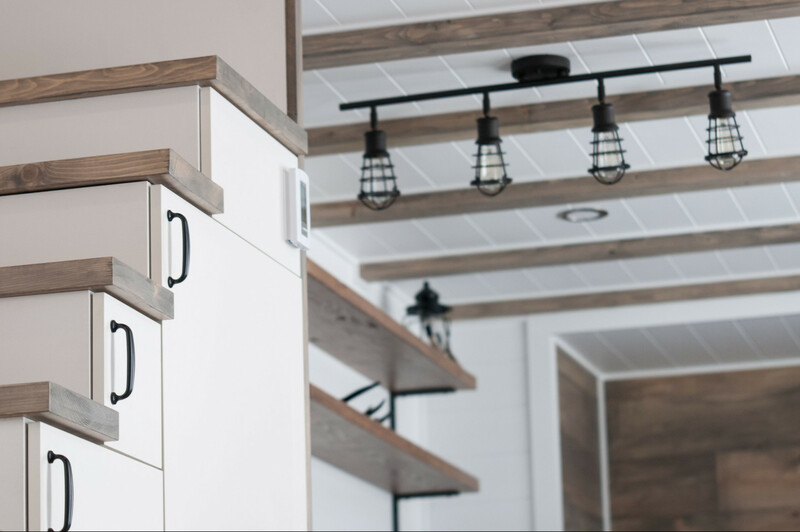 Located next to the refrigerator cabinet, a small cabinet stores the ladder that allows access to the sleeping loft over the bathroom. At the entrance to the interior, a lovely wooden staircase separates the living room and the kitchen, leading up to the master bedroom, one of the largest the company has ever designed. Again focusing on practicality, the stairs double as storage space. Furnished with custom in-wall cabinetry and small bedside tables with wall lights, the master bedroom is incredibly cozy and spacious. Natural light floods the interior. The tiny home is clad in almost all black, with acontrasting natural wood color. 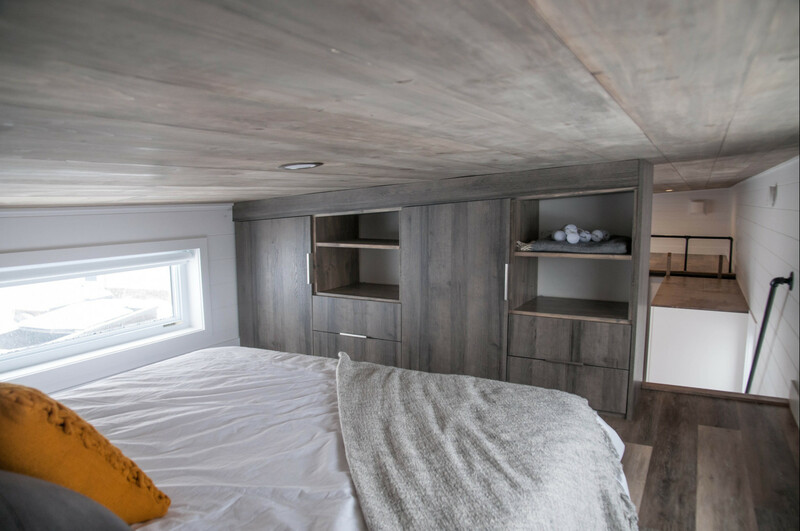 The Ébène Tiny Home was designed by Minimalists Houses. 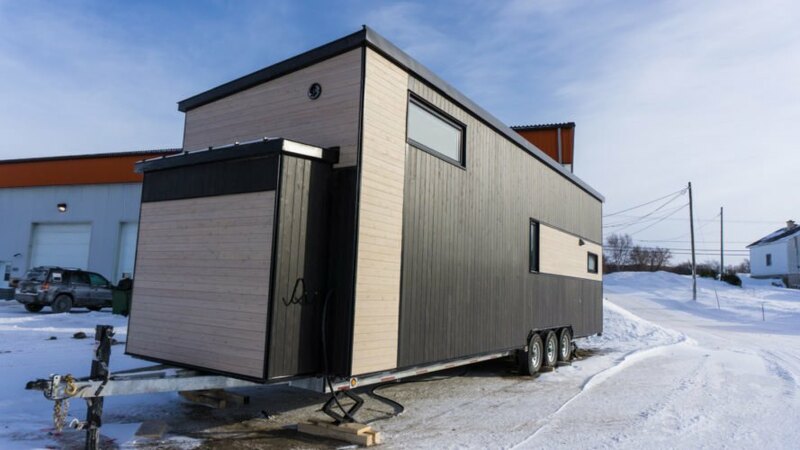 The tiny home was designed to withstand frigid Canadian winters. 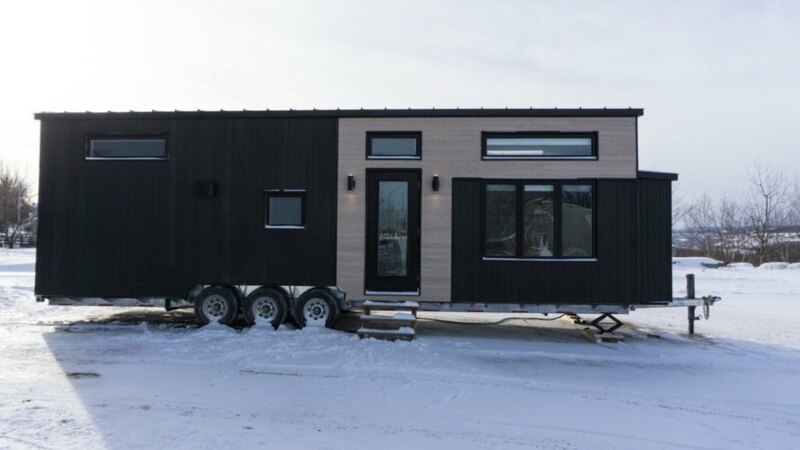 The tiny home is 34 feet long. The interior space is bright and airy thanks to its minimalist design. The living room was furnishes with a simple sofa and dining area. Stairs leading up to the sleeping loft double as storage. A comfy queen-sized bed fits perfectly into the sleeping loft. The living space is has a wooden accent wall. 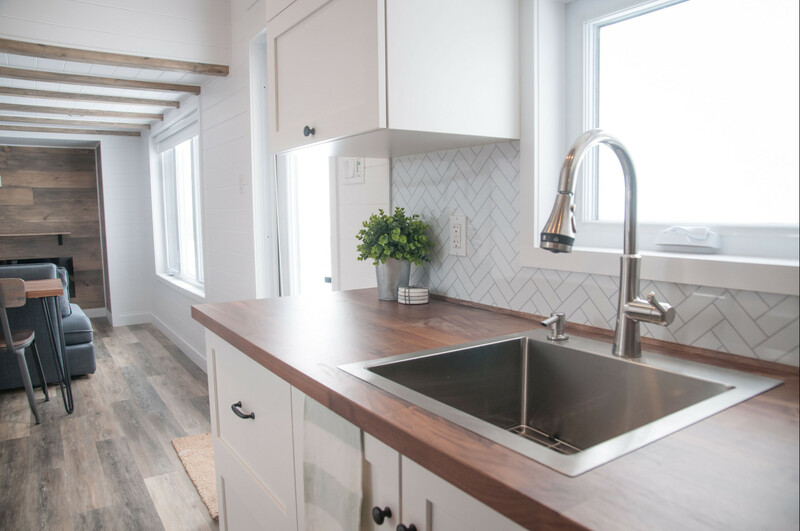 The kitchen features a butcher block counter with large farm sink. All-white cabinets give the space a modern aesthetic. LED lighting was installed throughout the home. The sleeping loft can be used as a guest room or for storage. 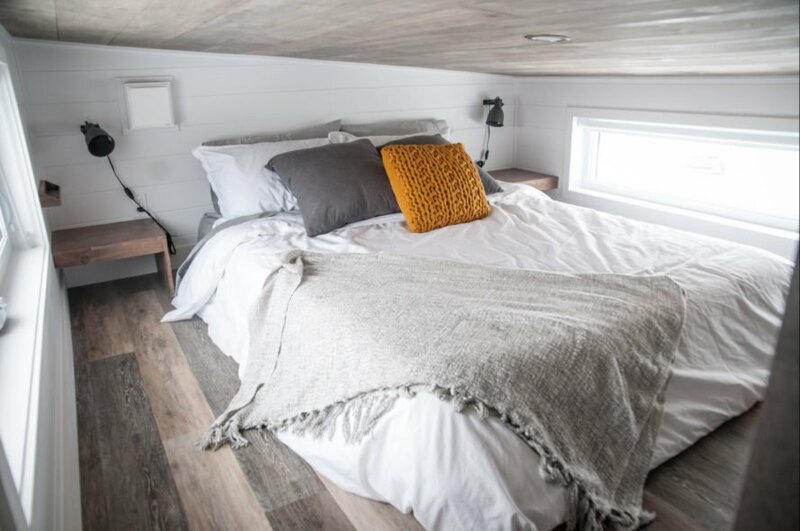 The bedroom is surprisingly spacious for a tiny home. The bathroom is light and airy with all-white tiles.